Quilting books may give inspiration for varied shapes. The illustration below is a diamond variant, another may be found in the brother ribber technique book (p 33, different color and KC knitting sequence). 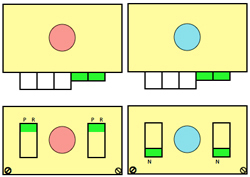 KC row direction does not necessarily matter in single color fabrics as long part buttons in both beds are set appropriately, unless double length is used, in which case KC row needs to be toward the color changer and the design needs to be in 2 row “color” repeats whether as actually punched, “drawn” and programmed, or with elongations used. The above repeat is suitable for punchcard machines as well. 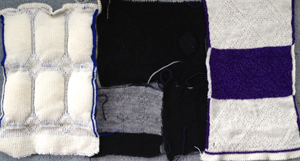 If knit without elongation one may use the same carriage settings as the previous sample above. 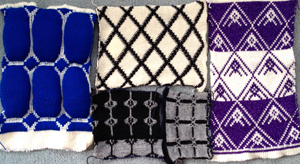 KC –> with card/pattern locked, knit one row to right, set card/pattern to advance, opposite part buttons in use, results in knitting tubular for nearly square diamond shapes. 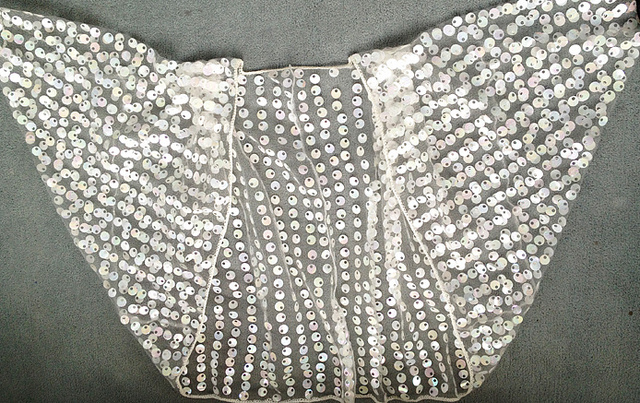 The “stuffing” below is small cut up pieces of waste knitting. 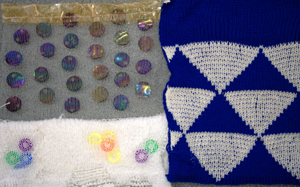 For longer diamonds or 2 color knitting, KC<– row is toward color changer. Settings on ribber need to be changed manually every 2 rows for both single color and 2 color patterning. When lots of needles are selected on MB, knit 2 rs using settings pictured on left, the ribber slips for 2 rows. If only a few needles are selected, knit 2 rs with settings pictured on right. The ribber will knit all needles, MB only those providing the outline of the shape in the front of the knit, sealing the layers. All ribber carriage slip setting changes happen with carriage on left, prior to the next pair of knit rows, before or after the color change. Errors are less likely if a sequence of the steps involved is developed and followed. The sample below was knit in 2/48 cash wool at T 3/3 using the above repeat. 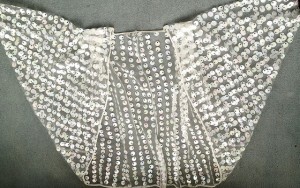 The fabric is sheer, and the joined sections of fabric are lacey.